Malaysia is a paradise for food. You can find food almost anywhere. . Today, for breakfast, my husband and I went to the Pelita Nasi Kandar shop in Desa Damai, Bukit Mertajam, but since it was sooo early, no nasi kandar was available. So we settled for just a plate of roti canai each drenched with fish curry, a glass of iced coffee and iced milo. . . The price? Only RM5!!!! If you are really on a tight budget, you can probably make it cheaper by forgoing drinks and opting for sky juice or plain water, I guess. 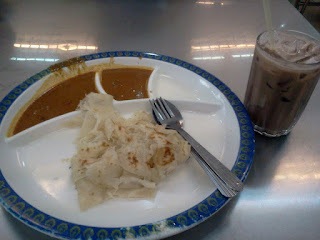 . .
Picture: one roti canai and one iced milo. . .